ANDY’S PICK :: PRINCE VALIANT HC VOL 06 1947-1948: Here is yet another must-read/must-own classic comic strip volume for the library. Fantagraphics continues it’s hardcover reprinting of Hal Foster’s beloved full page Sunday-only Newspaper comic, Prince Valiant. This wildly successful strip chronicles the life-long saga of Prince Valiant as he struggles between his three major responsibilities– knight of King Arthur’s round-table, heir to the throne of Thule (Denmark) and loving husband to the impossibly beautiful Aleta, Queen of the Misty Isles (Greece). This most recent volume–#6 — is a perfect place to join in on the adventure. It contains two full years (1947-48) of jaw-dropping art by the great Mr. Foster. Our Story: Newlywed Aleta is kidnapped and taken to sea. Val comes to her rescue but not before both ships go wildly off course and end up at Niagara Falls in the previously undiscovered North American continent. It is here that Mr. Foster points out that the history books are mistaken–apparently Virginia Dare was NOT the first child of European descent to be born in the New World. 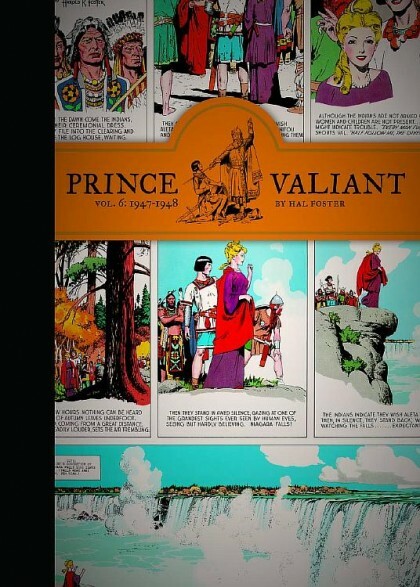 Please don’t be put off by Prince Valiant’s unique format (and silly hair-cut). There are no word balloons in the strip and the narrative text is in blocks in the bottom third of each panel; but, the pace is fast, the action and intrigue are plenty and the violence is un-apologetically bloody. In addition, Foster was a stickler for historical accuracy in depicting everyday life in the 6th century. 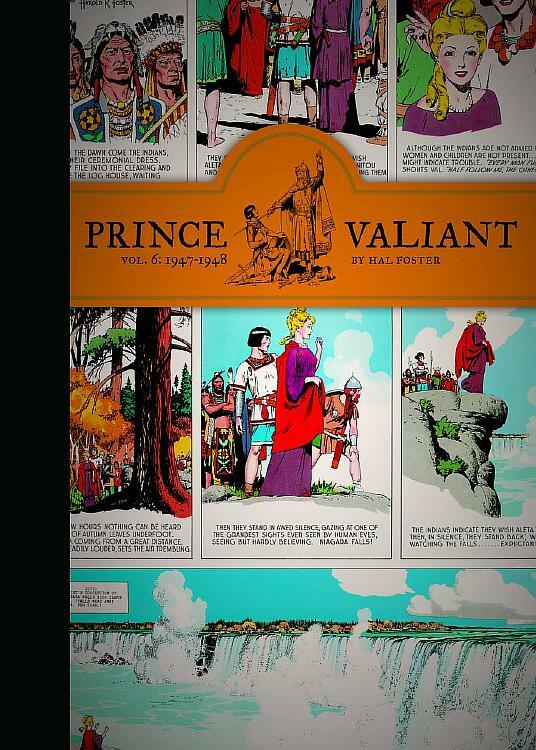 All together, the Complete Prince Valiant is a genuine treat and it is a steal at 39.95.